Every year, we produce a range of Semester One and Two examinations for Western Australian schools to use to assess their students learning. Past exams and a range of practice papers with marking keys for the new Senior Australian Curriculum ATAR Units 1 to 4 courses are now available for purchase by individuals for personal use. Ready to order for yourself? Before purchasing, we strongly recommend checking whether your school has already purchased any of our available papers, as refunds are not available. Next, make sure you have read our terms of sale for individuals and then click the button below. From as low as $2.95 per paper, including the marking scheme. Go to our individual use cost calculator, select your papers and our system will show you the best pricing for your order. Past papers and marking keys are supplied electronically in pdf format, usually within 24 hours of us receiving payment. Login here. Want a sneak peek? 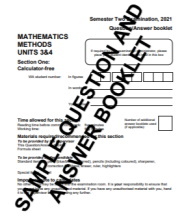 View sample pages from Math or English papers. 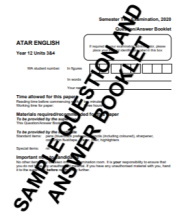 ATAR style - all our exams meet SCSA exam briefs and guidelines. Start at our login page.